Why Use the Services of a Real Estate Agent? | Omaha, NE Real Estate Agents The Bill Black Team Video Blog Omaha, NE Real Estate Agents The Bill Black Team Video Blog: Why Use the Services of a Real Estate Agent? Why Use the Services of a Real Estate Agent? This question is often asked, especially by homeowners who consider selling their homes by themselves. The fundamental first answer to this question is that an experienced realtor is an expert at what he or she does. Through hard work and education, they’ve acquired a set of skills that make the process of home buying and selling a lot easier than it would be by doing it yourself. So, what are the skills in the set I’m talking about? Well, for one thing, we have the skill of being the go-between. We’re the people who handle people and calls and separate the “wheat” (real buyers) from the “chaff” (non-buyers) without you ever having to deal with such situations. In Internet terms, we make sure you’re not “spammed” with worthless offers and target real deals for you.We’re also the ones who save you a lot of time by making sure you’re looking at appropriate properties and neighborhoods right from the get-go. And, speaking of neighborhoods, an experienced realtor will know them inside-out or will know how to find the latest information on them. That means he or she can get you into neighborhoods where the crime rate is low or non-existent, find you ones with great school systems, rising property values, etc. By the same token, an experienced agent will steer you away from neighborhoods where the trends are downward; that is, rising crime, falling property values, and so forth. And what about the prices of homes? Well, some people believe that we select them for our clients. Not true! We have no way of setting prices. They’re set by the market! However, we can guide you toward properties that fit your individual needs and are comfortably within your price range. Frankly, it’s not in our best interests to put you into a home beyond your means or that’s not right for you. When that happens, we lose clients and money! So, we’ll do our best to work within your price range and, based on current information (market supply, demand, etc. ), we’ll come up with the best negotiation strategy possible. Current information can include cost-per-square-foot of homes, ratios of list-to-sold prices, knowledge of the buyer/seller, etc. All this information is gathered by the agent and used to formulate solid offers. Another important skill experienced Realtors possess is objectivity. We have the ability to stay out of the emotional process that often occurs with the buying and selling of a home. Instead, we present your case in the best light possible, all the while holding your information confidential from any competing interests. One realtor skill that’s often not apparent is our ability to network with other service providers (housing inspectors, title companies, etc.) Professionally, we can’t recommend one specific vendor over another. However, we do keep lists of vendors with excellent reputations as well provide references for the vendors. This service allows you to choose the best provides for your particular situation. Now, here’s one realtor skill that everyone truly appreciates – the ability to handle tons of paperwork! Today, purchase agreements can run 10+ pages, and that doesn’t even include all the state and federal disclosure statements that are required in the current market! Heck, a real estate file can end up being 2-3 inches thick with paperwork these days! And it’s not only the heavy paperwork handled by realtors; it’s also the attention to detail within that paperwork. It’s their job (or a lawyer’s, depending on the state) to make sure all the information is correct because if it isn’t, it can end up costing the client hundreds of dollars. 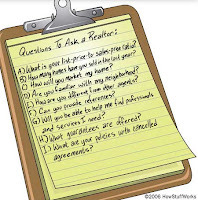 So, as you can see, there are many reasons why it’s wise to use an experienced Realtor for the purchase or sale of a home! To find out about the services I haven’t mentioned in this article, contact me today. You have a valued client moving to another state. But you don't have any REALTOR® contacts there. How can you find another REALTOR who has the appropriate education, expertise and professionalism and who will care about your client's needs as much as you do? With nearly 30,000 CRS Designees located throughout the country, it’s easy to find just the right professional for the job. More important, they are pre-qualified for your clients. As CRS Designees, they have completed advanced training in residential real estate and have a proven track record of sales transactions required to earn the CRS Designation. Like you, they are consummate professionals. And you know your client is being cared for as if you were their REALTOR® in the new city and state. Thank you for very good blog about Radon Mitigation. It's very nice.